This made me laugh. Last Friday we took Simon in the Ergo carrier to do some errands in the city. One was to drop off a library book. They check your bags when you enter and leave. Rob opened the diaper bag and I followed him, but was stopped to check my “bag.” The guards expression was priceless when I said “it’s a baby” and pulled back the sleep hood of the carrier. Monday we went to see Harry Potter 7.2 Simon was great. We went to the 12:45 show, the first one of the day. There were only about 30 people in the theater with us. Simon ate or slept all but the last 20 minutes when I walked him in the aisle by the exit. 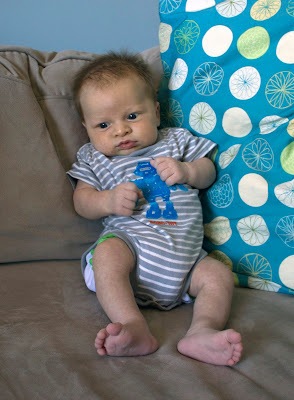 We can totally do movies with a baby…for a few more weeks anyway. Tuesday was the big One Month well visit. Wow! one month. The Squeaker (that’s his latest nickname because he squeaks all. the. time. and it’s hilarious) weighed in at 10 pounds 3 ounces (60%) His weight gain is awesome at about 2 oz a day right now, it will slow down. His height was 21.25 inches but I know this was wrong, he was 21 at birth and is much longer now. We are going to work on getting him to cooperate and stretch his legs for next month. No shots this time around, next month we start the vaccinations. Wednesday was our third anniversary. I really can’t believe it’s only been three years. I can remember life without the Squeaker, I have a hard time doing the same for Rob. It’s been fun, it’s still fun, and I hope it stays that way. Josh came over to babysit. I fed Simon right before we left. 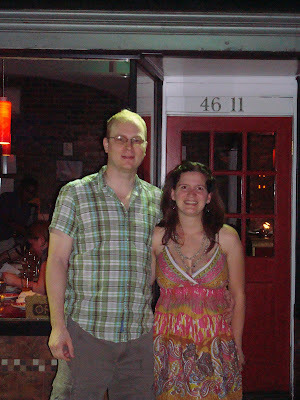 We went to Saffron Garden, an Indian restaurant a few blocks away. It was very empty, then we remembered it was 7 on a Wednesday. The food was good, but I think our old favorites are still our favorites. After dinner we took a walk then stopped at the wine bar, Claret for a glass of wine and the creme brulee. We were gone for 2.5 hours. Josh got to change his first diaper and baby was still alive when we got home. I really liked fixing my hair, wearing make-up (something I only really do for occasions anyhow) and wear a dress that did not have to be appropriate for nursing. Date night = awesome. BlogHer, the blogging conference I went to last year was in San Diego last weekend. I was excited to see where it would be next year, thinking that could be a nice vacation. It’s in New York, again. Which is disappointing because it means no travel, but good because it means I am absolutely going. And I think I will also attend Pathfinder day for the pre-conference workshops. Maybe I will meet some bloggy friends for real – anyone out there think you might come? Blogging is a hobby that I have stuck with for almost 4 years now, that’s epic for me. I want to keep evolving as a blogger and building new relationships. Rob has been home for two weeks now. It’s awesome. I am just getting to a point where I think I could tackle a trip to Manhattan on my own, I did it a couple of weeks ago and was on the couch for two days recovering. Two of us makes it almost easy. It’s great to have the family time. And also the tag team because taking care of a newborn is EXHAUSTING. I finally really get what 24/7 is because you have to be on top of it always. I can’t be away from Simon for more than a couple of hours due to feeding, but Rob can take care of him, bring him to me, and take him again. So I’m getting some longer stretches of rest. Last week (in addition to the Friday funny) we took the stroller in to run errands and had lunch at the Shake Shack. Some day when I have a computer again all of my ipod photos will be available for blogging, even though the quality is not so great. Then Wednesday we went to the Met. Simon was our ticket to the front of the excessively long line to see the Alexander McQueen exhibit Savage Beauty. One of the line attendants saw us and gave us a pass to go right to the front because of the baby. Woot! My adviser and another grad student came to visit yesterday. We mostly looked at and talked about the baby. But also got me up to speed on a few things for the fall semester. I’m looking forward to it this year. I’m teaching a class and taking a class and finishing two papers. I get to take Simon with me to the lab the day I teach, and someone will watch him during the class time. The day I have a class I’m going to leave him home with Rob because it will only be 3 hours of away time. When Rob starts back to work we’ll come up with a new plan. My sister and dad are coming tomorrow with their SOs. I’m really looking forward to it. Emily hasn’t seen him yet in person, and my dad saw him at 1 week. He’s gained THREE POUNDS in the last four weeks so he’s going to seem HUGE.